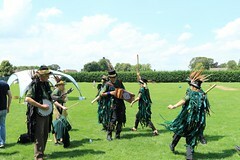 So today we were part of the International Community Celebration which was part of the Newmarket Music Festival. There were international children’s choirs (Canada and Romania), Irish dancers and our good selves. We had a blast of a time and that was not completely because we were dancing next to the Rutland Arms Hotel where we availed ourselves of a beverage or two. 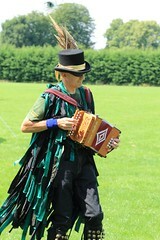 The sun shone and the audience were appreciative and we even got some of them to join for a dance. The truly amazing part was that we were dancing at the Bill Tutte Memorial who broke the Lorenz cipher in WWII. So of course we had to dance Lorenz’s Butterfly lent to us by Boggarts Breakfast who can rest assured that we are taking very good care of it. On Friday evening we will be at The Lamb and Flag Welney with our good friends Ely and Littleport Riot from 8pm. Well it has been far too long since I last put fingers to keyboard in this place. A bit of illness and other such happenings in life and before you know it, six weeks have gone by. Enough of that though, I should get onto explaining the title of this piece of rambling nonsense. So the first of the firsts will be tonight when we venture into another county for the first time. 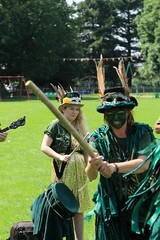 Yes, Norfolk will be subjected to our presence at the King’s Arms in Shouldham from 7:30pm. The second of the firsts will be this Sunday when we shall join the host of other morris sides dancing for Ely Folk Festival. We are very excited about this as it is our first festival booking, not just our first time at Ely. We hope though that this will be far from the last. Well I am not sure that it is actually a change as we did not have much of a plan to begin with. Anyway what am I going on about you may ask, well there was a tentative suggestion that we might dance somewhere else next week but tonight we decided that we would dance in Ely. We will start at The Cutter around 7:00pm and then move on to The Fountain for 8:00pm(ish). This is it. This is the plan. It will not change. Unless… – no stop that, we have a decision and we will go with it. No, I am not referring to the constellation otherwise known as Ursa Major amongst other things. Instead I am talking about the pub in Little Downham, and the reason I am doing so is that we shall be dancing there tomorrow, Wednesday, evening from 7:30pm. Unless that is the weather does not cooperate, in which case we shall be sitting inside and sampling their ales and ciders. The Plough is famous (well amongst those who know anyway) for two things. Firstly it is the place where the last known performance of The Mepal Molly Men was seen in the early twentieth century before the current tribute act took over in the late twentieth century. Secondly it does a rather good Thai meal. Come along, have a drink and enjoy the dancing.